No Rudy, no ... problem? While that's certainly not the case, the Jazz were able to overcome their star center's first-quarter ejection in a 118-91 blowout victory over the Houston Rockets Thursday night in Salt Lake City. Gobert, who was fined for criticizing the referees after Utah's last-second loss to Miami on Friday night, picked up two (extremely questionable) fouls in the first three minutes against the Rockets. On his way to the bench, he swiped at a bottle of powder on the scorer's table and had a few choice words for the nearest referee. After a quick deliberation by the officials, Gobert was ejected. Rather than complain, though, the Jazz—behind a raucous crowd—got angry. They played fast and they played hard, and Houston simply couldn't (or didn't try to) match their intensity. "We definitely had to deal with their emotion," Rockets head coach Mike D'Antoni said. "They played a lot faster than we did." 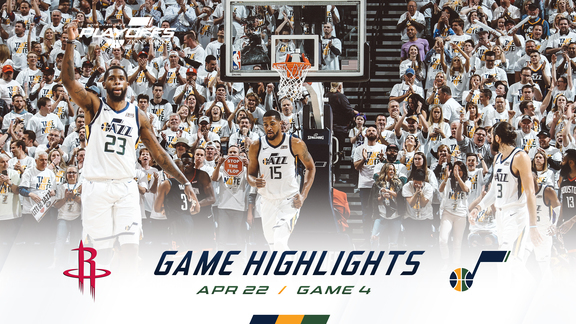 Favors led the way with a game-high 24 points, while Joe Ingles finished with 18 points, six rebounds, three assists and two steals. Danté Exum scored a season-high 15 points off the bench, and Ricky Rubio (13 points, six assists) and Jae Crowder (12 points, two steals) also scored in double figures in the win. The Jazz (13-13) have won two straight games—by an average of 30.5 points—and are now 2-0 this season against the Rockets (11-13). Reigning league MVP James Harden, who entered the night averaging an NBA-best 30.6 points per game, led the Rockets with 15 points on 5-for-16 shooting. Chris Paul and Clint Capela scored 12 points each in the loss. Favors stepped up in a big way, taking Gobert's place at center and finishing with 24 points, 10 rebounds, one steal and one block (and a net rating of +22) in 26 minutes. Favors shot 10-for-13 from the field and 4-for-4 from the field in his second double-double of the season. The focus was on Gobert literally right from the start, as both teams were perplexed when Utah's center was called for a foul on the opening tip. Three minutes later, at the 9:13 mark of the first quarter, Gobert was called for an offensive foul when Harden flopped to the ground in the post. Gobert then lost his cool and was quickly ejected. The Rockets immediately ran a pick-and-roll from Paul to Capela for a dunk to push their lead to 9-4, but the Jazz countered with what was probably the most important bucket of the game—a transition three by Ingles to ignite both the crowd and Utah's offense. 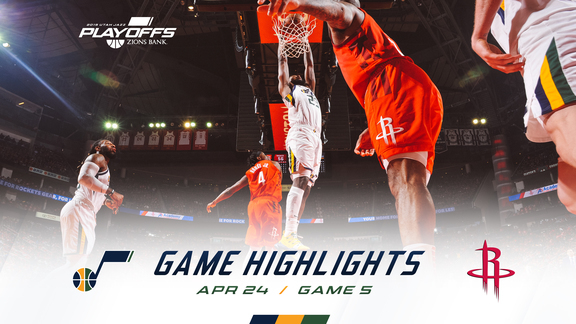 Another three by Ingles, layups by Rubio and Donovan Mitchell, and dunks by Favors and Exum put Utah up by 11 as the Rockets missed 14 of 15 shots. The Jazz took an eight-point lead into halftime, and then they blew the game wide open in the third quarter. Ingles and Crowder canned back-to-back threes before Crowder converted a three-point play to put Utah up 62-45 just a minute into the second half. Rubio hit Favors for an alley-oop layup, and then two more layups—by Favors and Rubio—increased the lead to 21. The Jazz would push their lead to 35 by the end of the third quarter and then cruise to the victory. The Jazz got to the rim at will against Houston's soft defense, outscoring the Rockets 70-42 in the paint. Utah also owned the open court, outscoring Houston 16-4 in transition. Houston turned the ball over often (23 times to be exact) and Utah converted those turnovers into 33 points. The Rockets scored only 10 points off of Utah's 12 turnovers. The Jazz are now 7-2 when they scored at least 20 points off turnovers. "The game’s always going to throw you adversity. It’s wrapped in different ways. The way that Derrick responded was terrific, and Ekpe as well." Ingles tied Bryon Russell for third place on Utah's franchise list of 3-pointers made (540). ... The game was televised nationally on TNT. ... Mitchell was quiet with six points on 3-for-9 shooting. ... Houston's 11 third-quarter points were a season low for points in any quarter. ... The Rockets allowed 100+ points for the 10th straight game. ... Utah shot 50.6 percent from the field. Houston shot 38.6 percent. ... Favors (26 minutes) and Harden (28 minutes) led their teams in court time. ... Utah dished out 26 assists (to Houston's 13). ... The Jazz are now 4-6 at home. The Jazz will travel to San Antonio for a matchup with the Spurs on Sunday evening. Tipoff is set for 5:00pm MT.